We're excited to release a free soft copy sampler of EPI. Specifically, this PDF shows the organization, content, style, topics, and quality of our book. 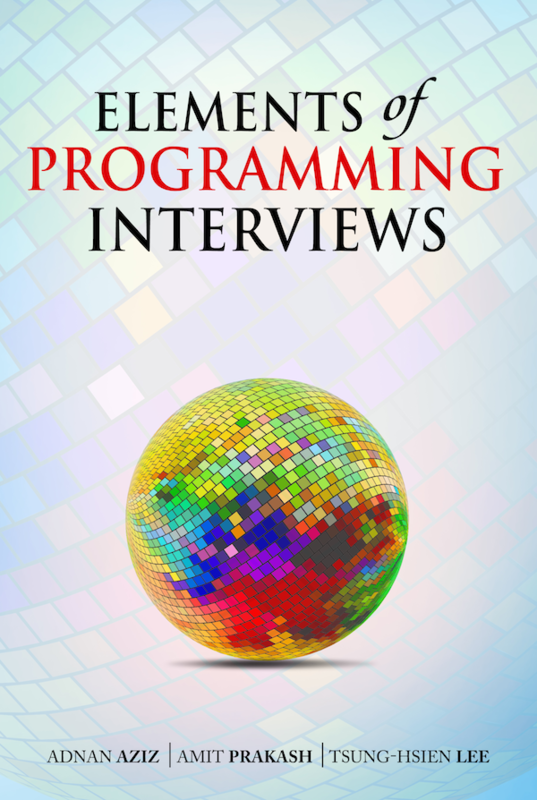 Amit, Tsung-Hsien and I have completed "Elements of Programming Interviews"! Buy it at Amazon.com - it's the best investment you as a software professional can make in your future. Wanted to work at a hot futuristic company? Struggled with an interview problem that could have been solved in 15 minutes? Wished you could study computing in the context of real-world problems? If so, you need to read Elements of Programming Interviews (EPI). The code of EPI is a collection of 300 problems with detailed solutions, including over 100 figures and 200 tested programs. The problems are challenging, well-motivated, and accessible. They are representative of the questions asked at interviews at the most exciting companies. The book begins with a summary of patterns for data structure, algorithms, and problem solving that will help you solve the most challenging interview problems. This is followed by chapters on basic and advanced data structures, algorithm design, concurrency, system design, probability and discrete mathematics. Each chapter starts with a brief review of key concepts and results followed by a deep and wide set of questions. EPI concludes with a summary of the nontechnical aspects of interviewing, including common mistakes, strategies for a great interview, perspectives from across the table, negotiating the best offer, and much more. Adnan, Amit, and Tsung-Hsien have worked at Google, Facebook, Microsoft, IBM, Qualcomm, and several startups. They co-developed algorithms and systems that are used by over one billion people everyday. They have extensive experience with interviewing candidates, making hiring decisions, and being interviewed. I received my PhD in EECS from UC Berkeley; my undergraduate degree is from IIT Kanpur. I joined The University of Texas in Spring 1996. Click here for my CV, and here for a list of co-authors. I helped Jing-Tang (Keith) Jang develop Alephus, an Android app for trading textbooks, which is now available for free at the Android marketplace. Alephus is designed for university students to economically trade textbooks with their friends and classmates. It uses barcode scanner, camera, instant messaging, maps, and GPS functionality to allow you to effortlessly find nearby items. You can login with your Gmail and Facebook accounts. "Minneapolis MN, 2007. Azinix is a system for monitoring and controlling IP networks - any feedback would be greatly appreciated. VIS is a system for analyzing the temporal behaviour of systems of interacting finite state machines. wikisearch is some code I put together for analysing the page structure of Wikipedia. Mathematics: Problems and Theorems in Classical Set Theory. P. Komjath and V. Totik. Springer, 2007. Natural History: The Ancestor's Tale. R. Dawkins. Phoenix, 2005. Programming: Effective Java, Second Edition. J. Bloch. Prentice Hall, 2008. Programming: Java Concurrency In Practice. B. Goetz. Addison Wesley Hall, 2006. I'm scanning my course notes from Berkeley, starting with my favorite classes. Berkeley CS Hardware Preliminary Exam, my notes. Math 202a, Introduction to Topology, by William Bade, Spring 1992. CS 170, Algorithms, by Raimund Seidel, Spring 1990. HW. CS 270, Combinatorial Algorithms, by Richard Karp, Fall 1990. EE 221, Linear Systems, by Felix Wu, Fall 1989. Math 125a, Introduction to Logic, by Robert Solovay, Fall 1991. Math 225b, Recursion Theory, by Robert Solovay, Spring 1992.
hits since October 1, 2001 (as counted by www.digits.com).